Welcome to my March/Spring E-newsletter, reproduced here for your convenience. If you’d like to subscribe to my newsletter so that it arrives in your inbox, click here. Happy almost spring! Thank you for taking a few moments to read my e-news. While 2019 snuck in and raced through the first months, I enjoyed a heap of school visits (see below), wrapped up my next book, King of the Tightrope: When the Great Blondin Ruled Niagara (October 1, 2019) and extracted a few scholarship essays from my high school senior. I am full of gratitude for all of it. My nine-year journey (yes, 9 years!) 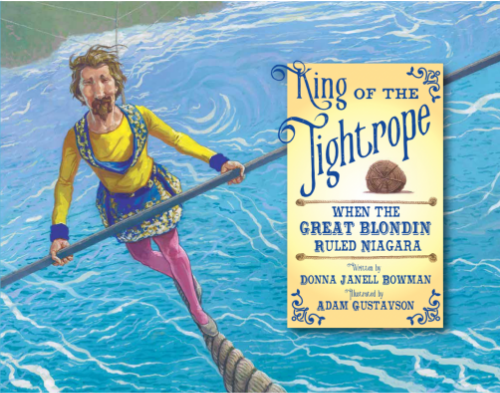 with King of the Tightrope—a STEAM-infused picture book biography—concluded with a frantic rush to ensure that advance copies will be available at the April 15-18, 2019 Texas Library Association (TLA) Conference in Austin. The art by acclaimed illustrator Adam Gustavson is gorgeous, as you can see from the above cover, revealed on Betsy Bird’s Fuse #8 Productions column for School Library Journal last week. The extraordinary research journey for this book involved surprising turns, a trans-Atlantic descendent connection, revelations of 160-years of perpetuated falsehoods, and a process-deconstruction that required consultation with multiple engineers. I can’t wait to share the journey on panels, in articles, and during presentations. Printer proofs have now been approved, and lucky TLA attendees and reviewers will be able to snag early copies of King of the Tightrope, long before the October 1, 2019 release. 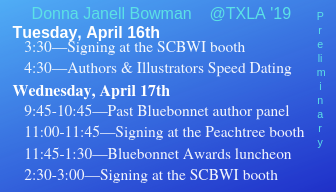 I’ll also be signing 2019 NCSS Notable Book Abraham Lincoln’s Dueling Words (Peachtree Publishers, 2018) and multi-award winning Step Right Up: How Doc and Jim Key Taught the World About Kindness (Lee and Low, 2016) at TLA, too. Below is my preliminary schedule, though I know of two additional events that will be added soon. Stay tuned! 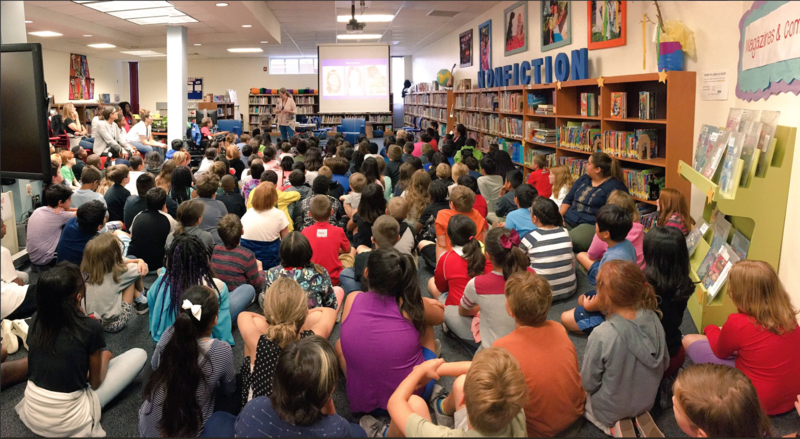 Between mid-September, 2018 and March 1, 2019, I have had the great honor of speaking at fifty-four Texas schools, and I have more author visits forthcoming this spring. I LOVE connecting with young readers and educators this way! A few months ago, I reflected on how school visits have inspired me in profound ways. Many thanks to the librarians and educators who welcomed me into their libraries and classrooms, invited me to return to lead writing workshops, and recommended me to others. They, like all library professionals and classroom educators, are literacy heroes! If you are interested in hosting me at your school, conference, or professional development event during spring 2019 or the 2019-20 school year, contact me. I would be delighted to travel anywhere in the world, and I strive to accommodate all budgets, so don’t hesitate to ask. Book a school visit or workshop by May 1, 2019 (event to occur by May 1, 2020) with the secret code SPRING10, and I’ll discount my honorarium by 10%. A big ole Texas-sized thanks to the library association awards committees in Texas, Tennessee, Utah, Indiana, Kansas, and Louisiana for nominating Step Right Up for their state awards. And to librarians and classroom educators everywhere who championed Doc and Jim’s message about kindness and then embraced the character education tie-ins in Abraham Lincoln’s Dueling Words. As a native Texan, I’m extra misty about the TX Bluebonnet nod. And I have friends to thank for the invaluable tips and advice for managing the wonderful outcomes, including author Chris Barton and author/illustrator Don Tate. Chris kindly invited me to respond to his two-question interview in January. I have a new appreciation for student-elected state awards programs because they not only inspire kids to read more, they also invite them to participate in the democratic process. Win-win! Hearty congratulations to 2018-19 Bluebonnet Award winner Patricia McCormick, author of Sergeant Reckless,and to all of the new and outgoing nominees. 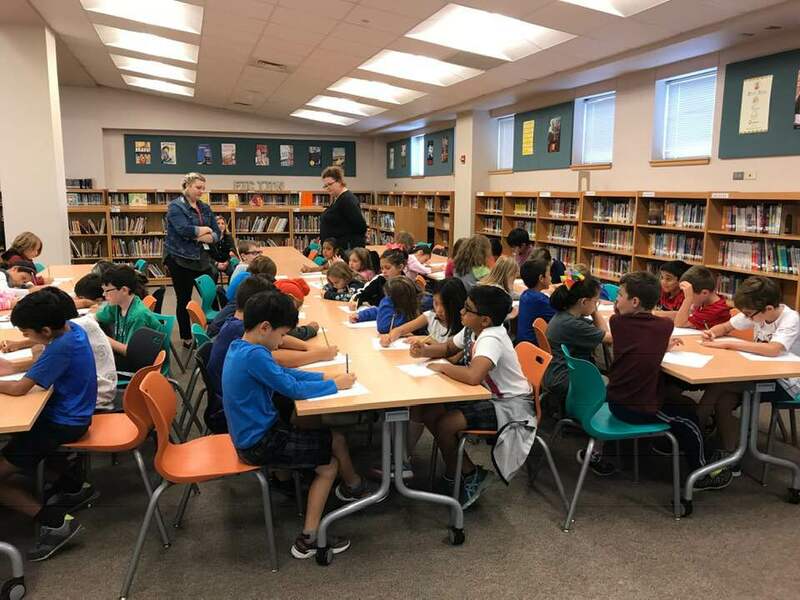 If you are a librarian or classroom educator whose young writers are struggling with a particular writing concept—or if you are eager to prime your young writers for upcoming standardized tests, writing workshops led by a qualified author can expand upon and reinforce your curriculum goals. Unlike traditional presentations, workshops are hands-on writing for kids. In fact, this week, I’m tweaking three requested workshops—about voice, expository writing, and scene-building, for Texas schools. I love the swish-scratch sound of 50-60 pencils in the hands of inspired youngsters. If you would like information about my offerings, contact me. If you’re looking for a recommendation for other available writers, I’d be happy to share that, too. If you don’t already know about #KidsNeedMentors, I hope you’ll pop over to the dedicated page on founder/author Ann Braden’s website. 2018-19 is the group’s debut year, and I am delighted to be a mentor for two of the three hundred registered classrooms. A lovely part of this new outreach is the chance to support teachers. I’ve enjoyed meeting my third-grade mentee classes—one in Allen, TX and the other in Decatur, TX. In addition to Skype visits and a recent spontaneous in-person visit to their classrooms (so much fun! ), I have sent letters, books and other goodies to further connect with the students and teachers. And they’ve sent me letters and artwork, too! Once you’ve checked out Ann’s website, I recommend you read her debut MG novel, The Benefits of Being an Octopus. It’s a truly heartwarming and enlightening story that humanizes issues of poverty, domestic violence, and even gun laws. * Abraham Lincoln’s Dueling Words is a featured American History selection on Betsy Bird’s Fuse #8 Productions column on the School Library Journal blog. Jenn Bailey’s A Friend for Henry, illustrated by Mike Song. Have students dissect effective TV commercials and compare them to Aristotle’s Rhetorical Triangle. If you know somebody (perhaps a retired librarian?) who might be interested in a very part-time virtual assistant job, please send them my way. I could use help with booking and managing school visits and other speaking opportunities. Thank you! 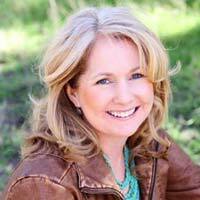 « Writing a Picture Book Biography is Quick and Easy, Right?